Since I've been neglecting my blog, let me post some info about NSAIDs that came up at work. 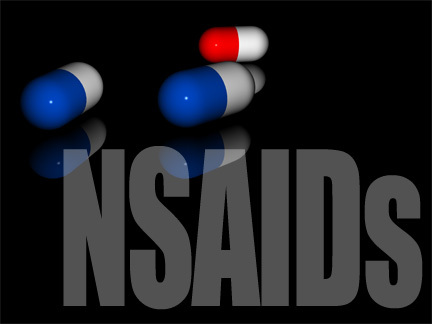 NSAIDs are short for NonSteroidal Anti-Inflammatory Drugs. They include ibuprofen (e.g. Motrin and Advil), naproxen (Aleve), and prescription-only diclofenac (e.g. Voltaren and Cataflam), celecoxib (Celebrex), and rofecoxib (Vioxx, now withdrawn). Increase risk for heart attack. Each NSAID has a better or worse profile for the items above but most have some level of these effects. For example, all NSAIDs raise blood pressure, but how much depends on the dose and schedule (when and for how long you take it). It's the last two in this list that have been drawing attention. Earlier this year a group of researchers from Denmark reported in the American Heart Association's prestigious journal Circulation that short-term use of NSAIDs increased risk for heart attack - in healthy people. We already knew about the heart attack risk with NSAIDs, but not its effect on an apparently healthy population. They started with the entire Danish population over 10 years, over 4.5 million people, and filtered out anyone who had been admitted to the hospital within the past 5 years and had no chronic use of any serious medication. That left a little over one million people. This was not an insignificant study. The above was heart attack risk. Last month at the European Society of Cardiology's 2010 Congress, the same authors reported an increased risk for stroke from NSAIDs in a similar large and healthy Danish population. "This is very serious, as these drugs are very widely used, with many available over the counter. ... We need to get the message out to healthcare authorities that these drugs need to be regulated more carefully." "Gislason noted that there was also a dose-relationship found, with the increased risk of stroke reaching 90% (HR 1.90) with doses of ibuprofen over 200 mg and 100% (HR 2.0) with diclofenac doses over 100 mg. He pointed out that the results were particularly striking, given that this study was conducted in healthy individuals." Doses of ibuprofen over 200mg? That's anything more than one cheap over-the-counter Advil caplet. "If half the population takes these drugs, even on an occasional basis, then this could be responsible for a 50% to 100% increase in stroke risk. It is an enormous effect." NSAIDs are effective pain relievers. Sometimes need for pain relief outweighs risk for heart attack or stroke. Who should weigh this? The consumer or the physician? Should NSAIDs be made available only by prescription? "[NSAIDs] are associated with adverse renal effects caused by the reduction in synthesis of renal prostaglandins through inhibition of cyclooxygenase (COX)." A few years ago, I quit taking NSAIDs for arthritis. My blood pressure dropped 30-40 points, within one week. I've taken almost every medication on this list - they were all by prescription when I started, and when I self-dosed, I used less than what had been advised. I hope they remain OTC, with a warning label. Flonase, a steroid nasal spray, was forced to take out full page ads in 2003? warning of serious side effects - prior to that, Flonase was given out freely (by prescription) as a harmless nasal spray. Oh, and nice to see you posting again. NSAIDs are how I got an ulcer when I was 18...will never take them again. I control my headaches with diet now. Wow, that's quite a drop, virginia. If it comes as a surprise to someone that their Advil or Motrin raises their blood pressure and slows their kidney's filtering (a problem for diabetics to begin with), and raises their heart attack and stroke risk, is that an argument for making them prescription only? I didn't know the extent of their effects until my recent digging. "Ask a doctor before use if ... you have high blood pressure, heart disease, liver cirrhosis, kidney disease, or asthma." I have to say, that didn't do it for me. I quit taking NSAIDs after reading (somewhere)that it caused high BP, and decided to try doing without Advil for a month. Also just read (I think it was on a European Lipitor site)that lactose intolerant patients should not take Lipitor - I had argued with my doctor that it was making me sick (as in doubled over in stomach pain), and she said: oh, you're just overly sensitive to all meds. Finally solved my problem by taking it with grits - made with Lactaid - not knowing that the residual lactase in the milk product was helping my system deal with Lipitor. I was trying to figure out a solution (for the NSAIDs) - maybe behind the counter, like Sudafed. You have to hand over your driver's license, and your purchase is recorded. But, that transaction could lead to denial of insurance coverage if the purchaser later develops heart disease (even if unrelated). overly sensitive to all meds... I don't get that. I take a fair amount of ibuprofen for back pain (and for a couple other conditions that flare up on occasion). But for back pain, pretty regularly, usually at night so I can get some sleep. My blood pressure has never risen b/c of it, though--last reading was 105/65. But I still find this study disturbing. I certainly don't want to up my risk of heart problems. So what does one take for pain? Buffered aspirin? Btw, I was under the impression that ulcers are caused by a virus, the name of which I forget. here's the answer for Dr. mel. Thanks for the link, Virginia! And thanks for the feedback, Bix. I guess I'll just try taking as little as possible. Re trying to fix pain problems w/ diet, I don't think that will work for sciatica (though I wish it would, and I found Melissa's blog, "Hunt, Gather, Love," very interesting! Bix, my back and joint pain has flared up again so I'm revisiting the NSAID issue. Have been trying to use buffered aspirin, but if I take that more than once a day (say, 3 at night for sleep), I start to get funny twitchings in nerve endings on the back of my head (go figure). So I was looking at some of the recent reporting on the Denmark study. WebMD said (among other things) that "Although low doses of ibuprofen seemed to lower the risk of heart attack, the study found a trend toward increased heart attack risk with high doses (more than 1,200 milligrams per day or more than two 200 milligram pills three times daily)." I don't normally take that much when I take it. It also said "The silver lining to the Fosbol study is that naproxen (brand names include Aleve and Naprosyn) does not appear to carry any risk of heart disease or stroke." Though it said that all NSAIDS increase risk of internal bleeding. It is, as with anything, a cost-benefit decision. When the perceived benefits outweigh the costs, you take the drug ... the analgesic, the antihypertensive, the chemotherapy agent, whatever. I would do it with the aid of a physician. It may be helpful to understand the cause of the flare-up and short-circuit the pain before it occurs.